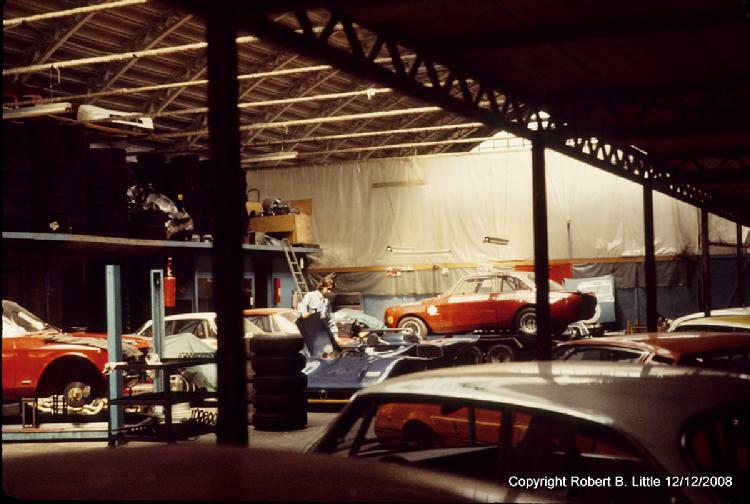 Archive parts storage area and customer GTA and GTV Rally preparation area. Ing. Chiti's white Berlina and Ing. 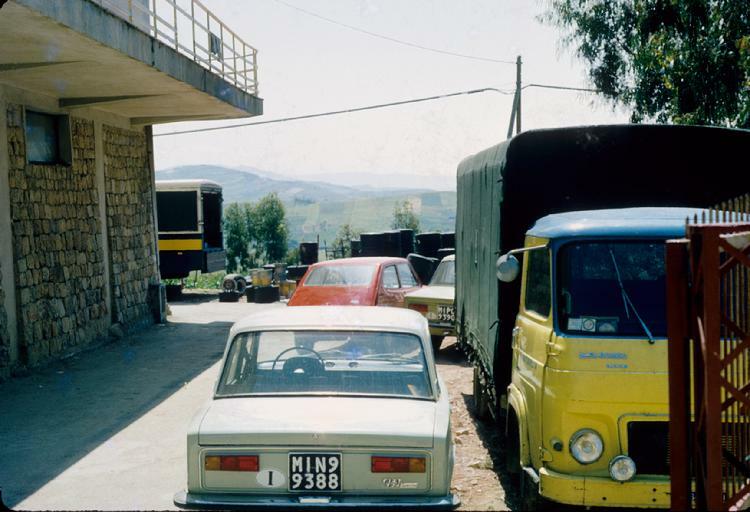 Garbarino's Berlina are pictured in this area where new vehicles were delivered from Arese for dissassembly, all non-essential parts being removed here. 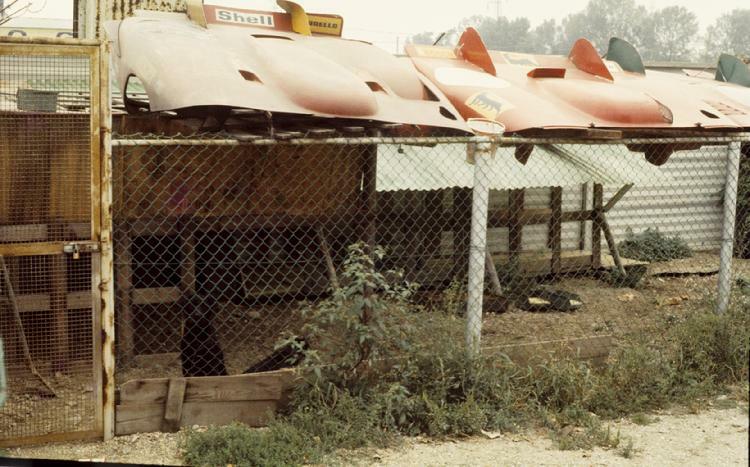 Lots of interesting items in rafter storage...including sets of Firestone tires made outmodeled by new Goodyear contractual obligations...but retained for eventual historical reconstitution of early cars at some later date. Some early "T-33" chassis are seen stored away in the upper left corner of the photograph. Another view of the 'customer' car area and reception for new factory-produced vehicles for the first intial stages of conversion. 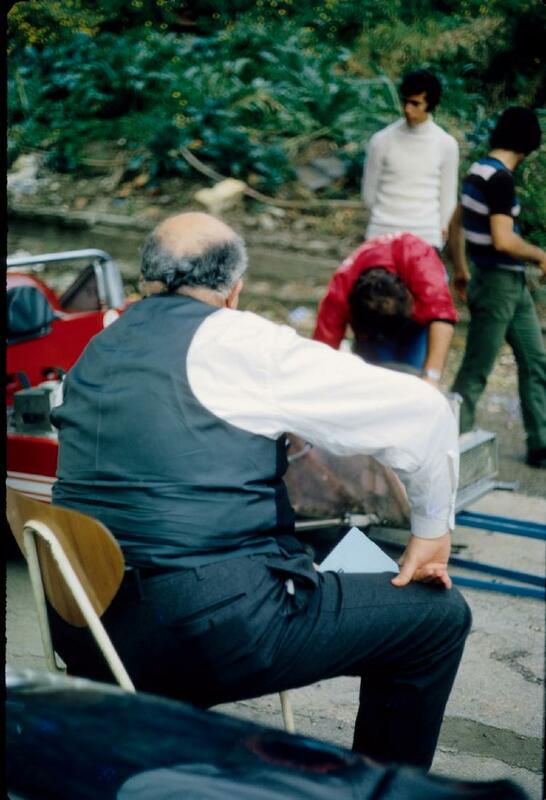 "Ah...the lunch hour..." with junior mechanic on motor assembly Renato Melchioretto. Here my friend Renato takes a 'dream cruise' in a one year old T-33 V-8 that had been purchased by a private individual. It is the only T-33 to have been painted in a dark shade of blue. People such as Carlo Benelli, aka "Riccardone" would customarily purchase competitive cars among previous models that were of no further use to Autodelta but would continue to depend upon Autodelta for repairs and renewal...explaining why it is parked in the customer reception area just off the main lobby....and far away from the prying eyes of interested visitors.! This photograph is particularly memorable to me as I used to fall asleep at night in the cockpit of my choice of the T-33s in the Sebring garage while I 'stationed' there as the 'overnight watchman' in 1972. 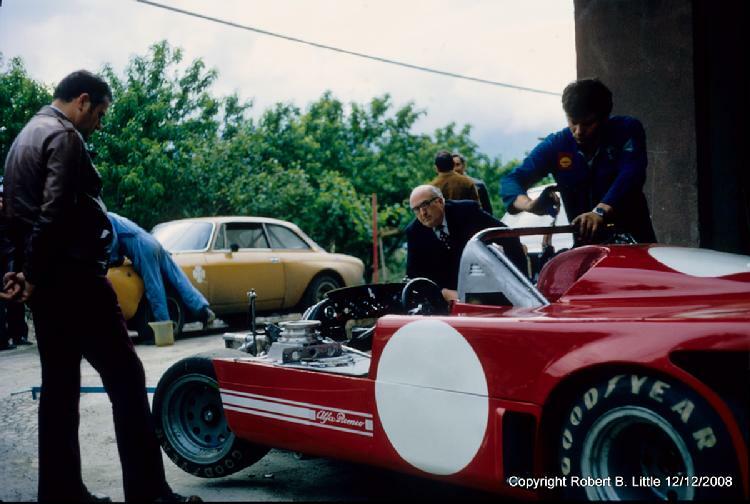 Riccardone was killed in this car during a hillclimb contest at Castione-Neviano in May of 1972....the month after this photo was taken. 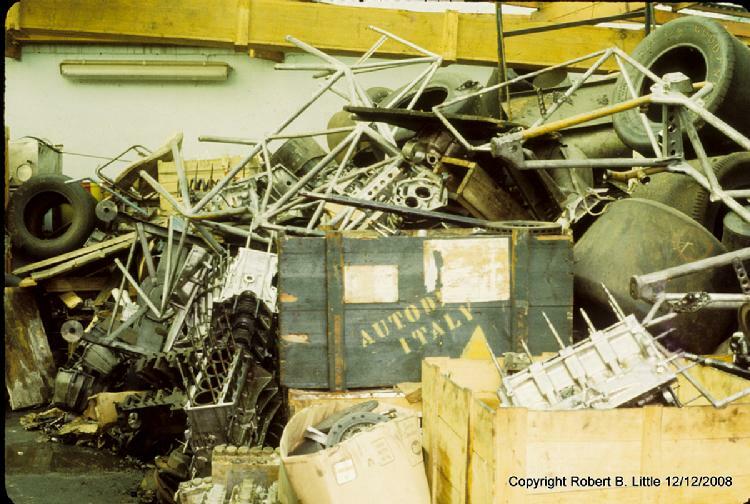 It had always been my fantasy to have been able to burrow through this exciting pile of 'used history' and assemble full-sized models of various T-33 components or at the very least make glass tables using engine block castings. As a visiting college student I simply could not take anything more with me than I could carry nor could I afford to ship anything as a memento except these tantalizing pictures. 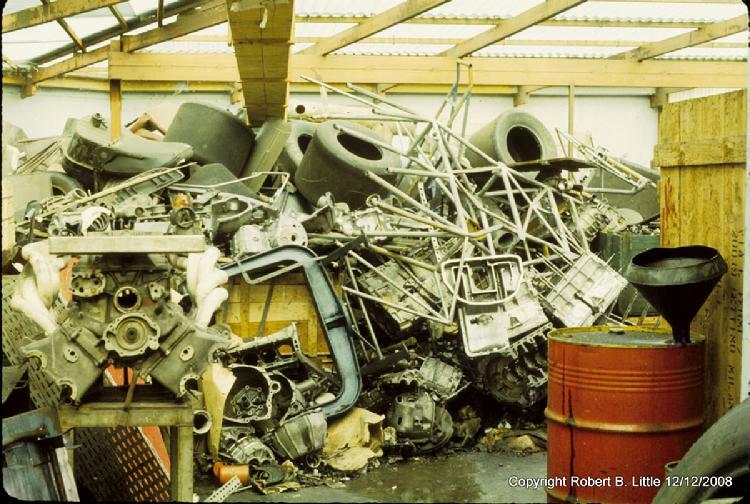 I had seen on one occasion a discarded "H" shaped big tubular chassis from the first Fleron V-8 2.0 liter...and from that point forward the historical and preservational value of these parts never left my mind to this very day. Don't you wish you could tear into that pile to see what GTA treasures you could find somewhere deep down.... repair them and install them on your car? How about finding all of the parts necessary to assemble a full-sized model of a V-8 engine and transmission with a little help from your local machine shop and neighborhood welding specialist? Carlo Chiti, Directore Generale was a true animal lover, saving dozens of them from the streets of Milano. Living inside the Autodelta factory in the "infirmaria" as I did for a while in 1972, I came to know and befriended the stray dogs and cats, some injured or sick, that Ing. Chiti would rescue from the streets of urban Milano. Some he would bring home to his downtown apartment...others would live at Autodelta here on Via Fermi, #7. They would be fed leftovers from the lunch-time cafeteria and patrol every inch of the small factory for rodents and nighttime intruders. They provided company and companionship to the workers who were fabricating GTAms, T-33s and rally GTVs. Pictured here are some of the surplus tail sections Ing. 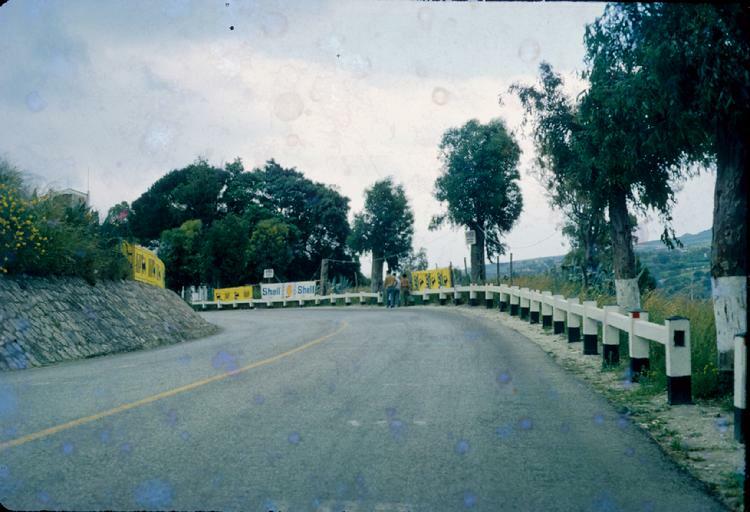 Chiti directed to be used in the late 1960s / early 1970s to provide shelter to some of the animals who were chosen to patrol the employee parking lot across from the main walled compound. One evening I asked Chiti why he collected so many strays. He struggled to express himself using what few words he knew of English at the time: "Danger...for Life." Those words have since been indelibly impressed in my memory to this very day, serving to symbolize for me his great compassion and respect for life. Would that same feeling be held sacred among his contemporaries 'back in the day'...? 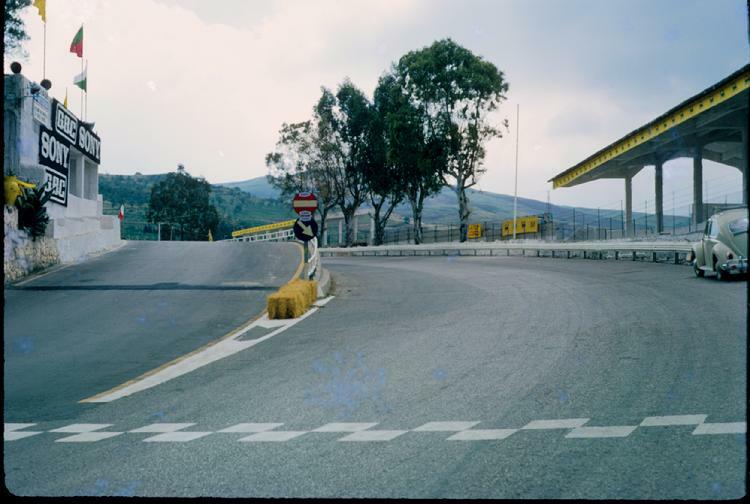 Now, let's travel down to Sicily for the 1972 Targa Florio ! 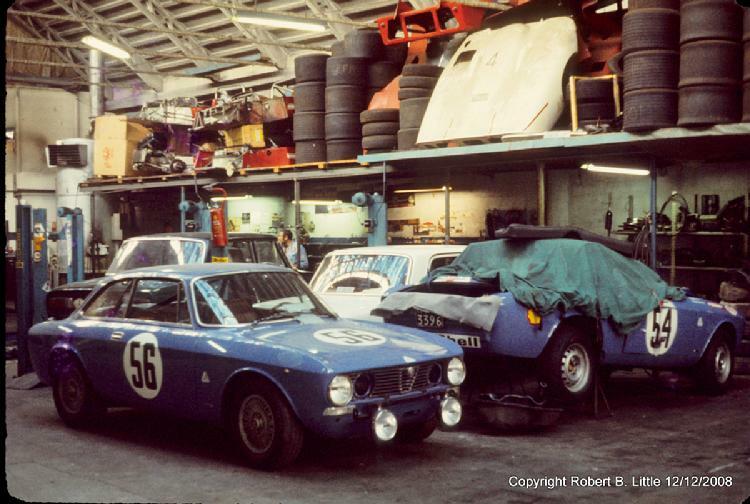 The time eventually arrived when I started to grow a bit weary of spending most of my days in this wonderful walled factory, watching the true descendants of the Renaissance applying their DNA-evolved talents to create some of the most exciting racing vehicles of the Twentieth Century. 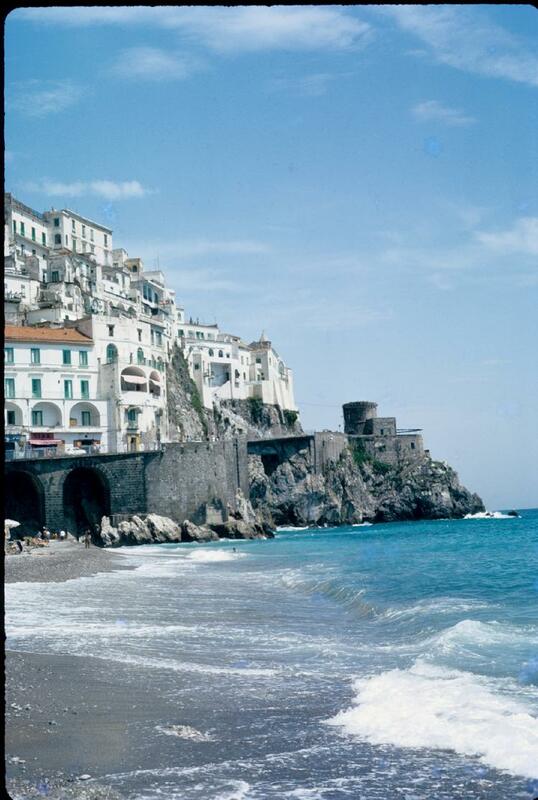 I know how this sounds to you, dear reader, but I was itching to travel and experience more. In my mind I could picture these same men working under the direction of a Da Vinci or a Brunelleschi bringing to life world-class achievements in design and construction. While I indeed enjoyed day trips to downtown Milano, testing at Balocco or walking the village pathways, I knew a number of important races were coming up and asked Ing. Chiti one afternoon if I could participate. 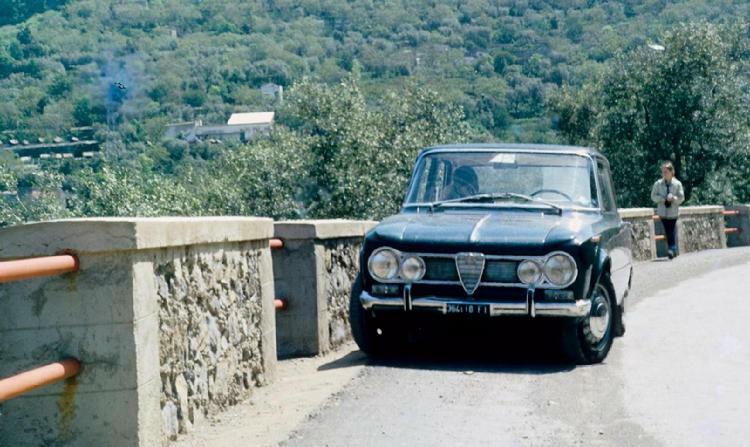 The next day he had plans made for me to be driven to Florence the following week to pick up a Giulia sedan to be driven my me to meet up with the team in Sicily. 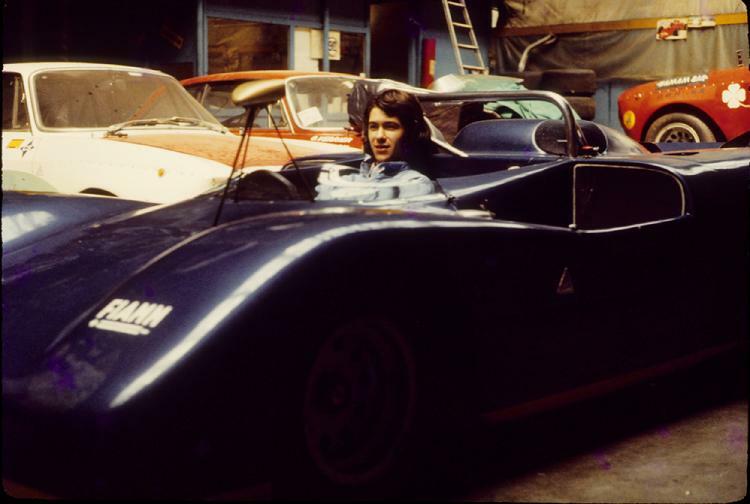 The car was to have been loaned to me through a long-time friend of the Ingeniere..a man I believe named Mr. Baldassarini, who had an earlier association with Autodelta and who now had owned an Alfa Romeo dealership S.C.A.R. in a southern Florence neighborhood. On the appointed day, having being driven first to Weber S.p.A. in Bologna to pick up some necessary parts in a ratted out yellow Spider muletto (chassis 00001...the first prototype Kamm tail) I finally arrived in Florence to see my Giulia being washed and polished. 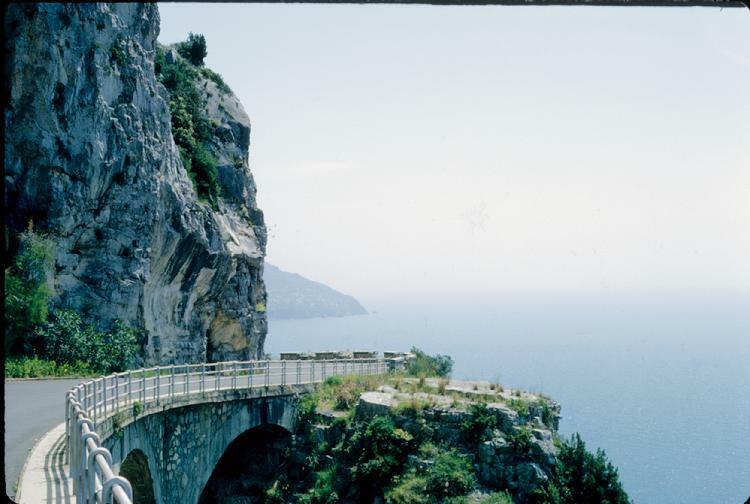 With keys in hand and a fistful of tourist gasoline discount coupons I began a non-stop, moderate to high speed twelve hour race of my own down the spine of the Apennine mountains to the lower tip of the Italian peninsula using some of the original Mille Miglia roads. Becoming quite sleepy by sunrise the next morning in Reggio Calabria, I found a quiet place to sleep near the ferry docks to Sicily. This is the Alfa that has captivated me the most... a 1600 with 45 mm Webers. The more I drove it from Florence to Reggio Calabria, to Cerda and back to Florence at high speed on the back roads of the spine of Italy's old mountainous roads ...the more convinced I became that the105 series sedan was (and remains to this day) the best overall handling and driving Alfa Romeo of the mid-twentieth century....once again...with the notable exception of the new Alfa Romeo 4C locked in "Dynamic Mode". After 1100 miles driven last year in a 4C (1700 kms) and three decades driving nearly every other Alfa Romeo automobile since the advent of the 101 series cars...and as District Service Manager for Alfa Romeo, USA for a total of Alfa Romeo mileage dirven exceeding 1,000,000 miles...the Giulia and the 4C are at the pinnacle of driving excitement and thrill satisfaction in my opinion! 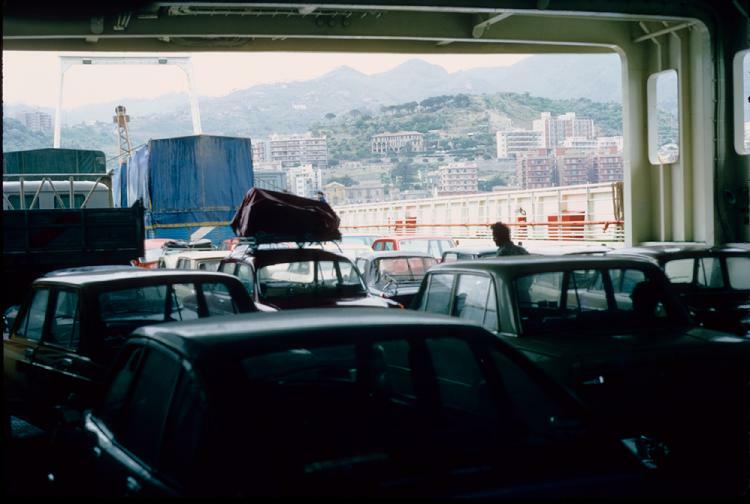 On the ferry passing through the Straits of Messina from Reggio Calabria to Messina, Sicily. 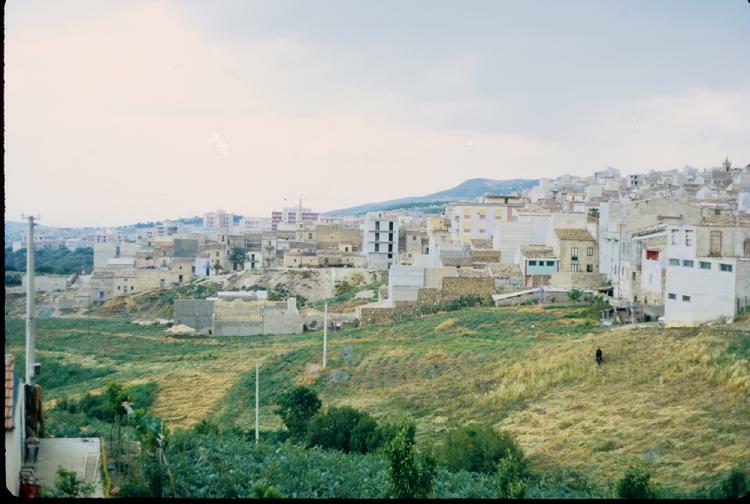 Welcome to beautiful Sicily...a most stunningly barren and historically fascinating island. 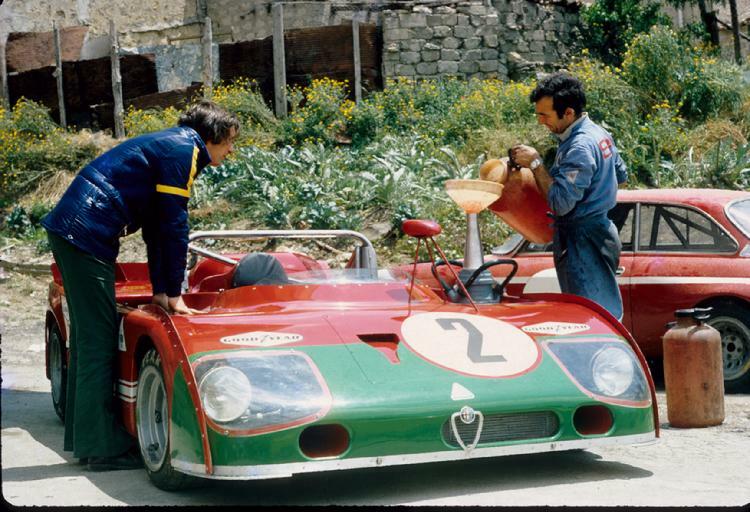 We are grateful for the opportunity to present Alfa Romeo T-33/3 driver Vic Elford as he talks about the Targa Florio and takes you on a portion of the old original circuit...just as it was in 1972. 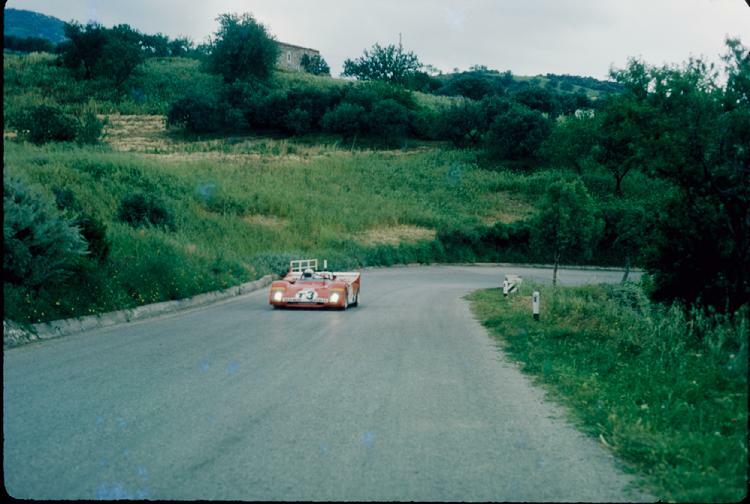 On The Road of the Targa Florio. The 44 mile circuit remained open to vehicular and horsedrawn traffic during all days except the Sunday race...necessitating ultra careful and alert driving required to safely navigate the mountainous circuit . Here a farmer, his horse and his dogs are barely visable due to the fact the winding circuit is composed almost entirely of blind twists and turns! 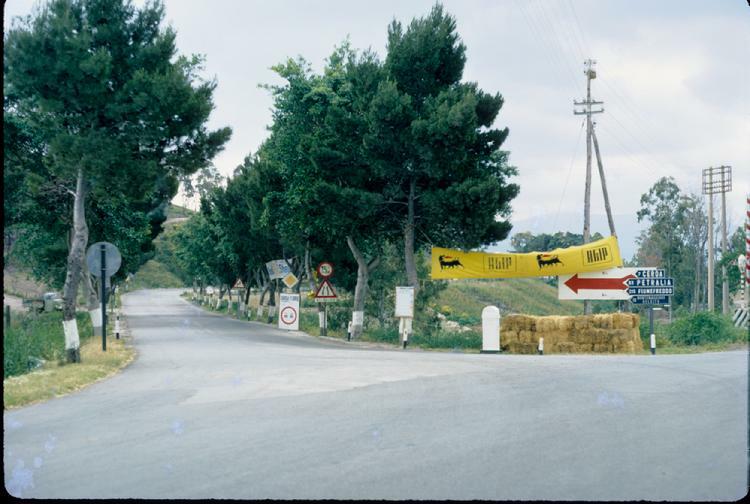 As I was saying, one must be extremely vigilant when driving the Targa Florio route during the week prior to the race. In this case...it was all I could do to suddenly encounter and avoid colliding with this Ferrari 312P that came from out of nowhere! Camera in one hand...steering wheel nervously gripped tightly with the other hand... as I swerve to the right side to narrowly avoid hitting the Ferrari head on! 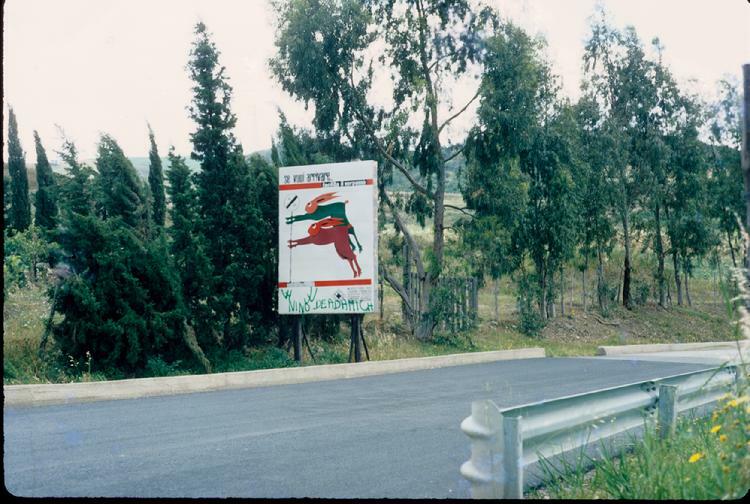 One can see the enthusiasm of local race partisians in their vigor to promote their favorite driver in the race, such as in this case where 'Victory to de Adamich' or 'Victory to Nino' (Vaccarella) was a common sight on signage and on the pavement. 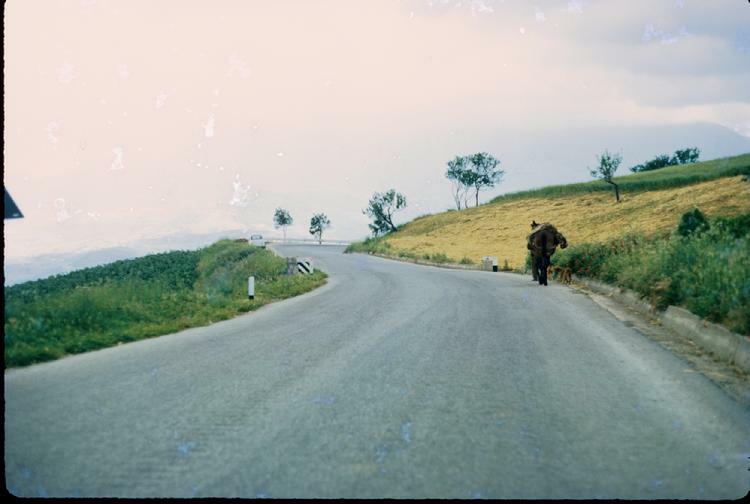 Much of the same 'citizen enthusiasm' had been found on race day on the Route of the Mille Miglia from Brescia to Roma and back. 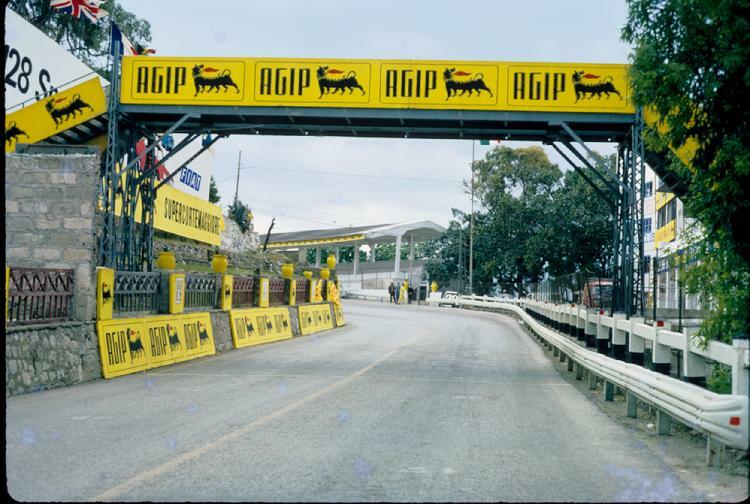 The 44 mile circuit has very little guardrail, almost no obvious directional signage and the occasional farmer, horse and wagon to be particularly watchful for during the week of practice before race day. The approach to the start / finish line, the pits and the historic grandstand. The start / finish line...with pit road to your left. 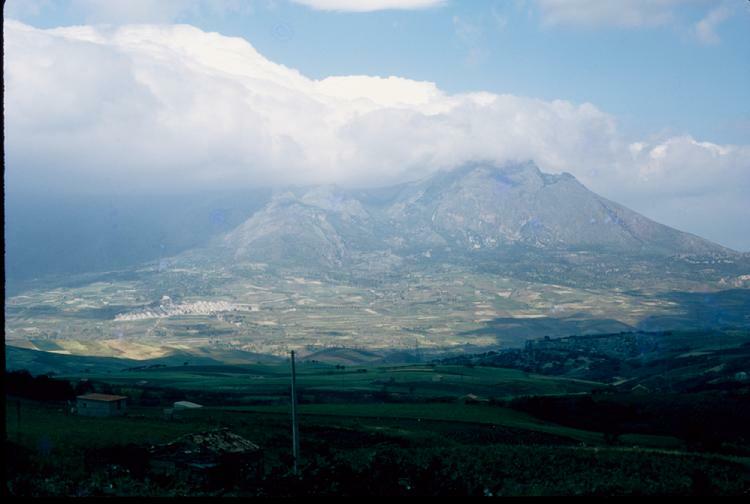 The Village of Cerda, Sicily and the focal point of Autodelta activities. 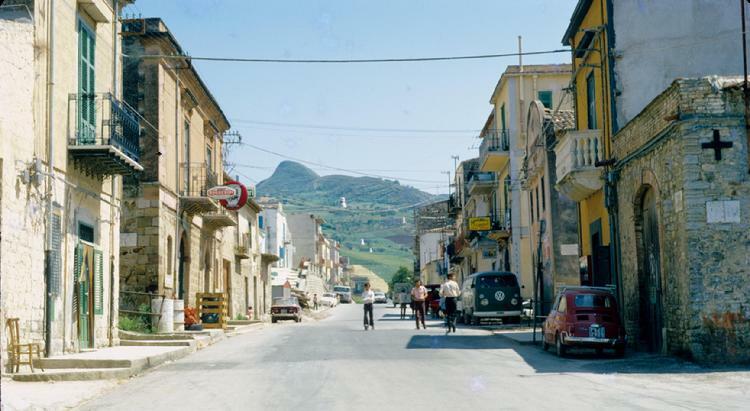 A typical village in rural Sicily, this is 'Main Street'....in Cerda. 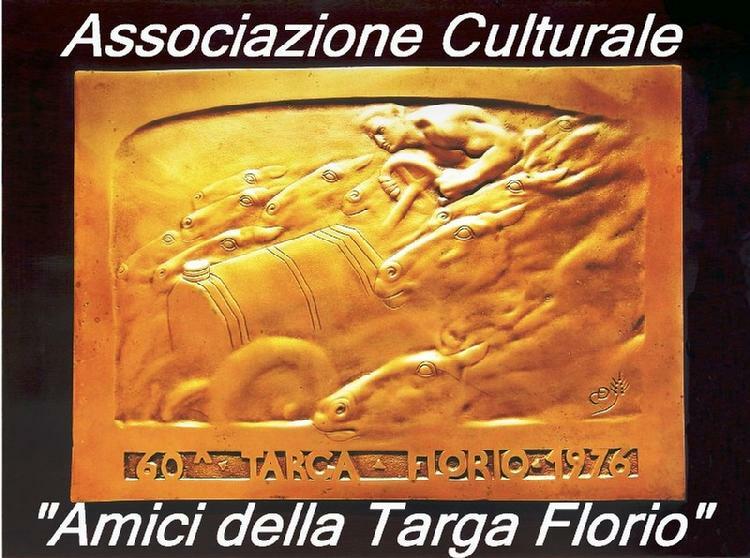 Headquarters of the Autodelta Targa Florio effort. Built on the side of a slight hill, the back of the building featured garage space for the team, a measure of privacy and good food. The garage facilities of the Hotel Aurim provided lots of space for the huge Autodelta machine shop bus and the familiar Autodelta transporter. 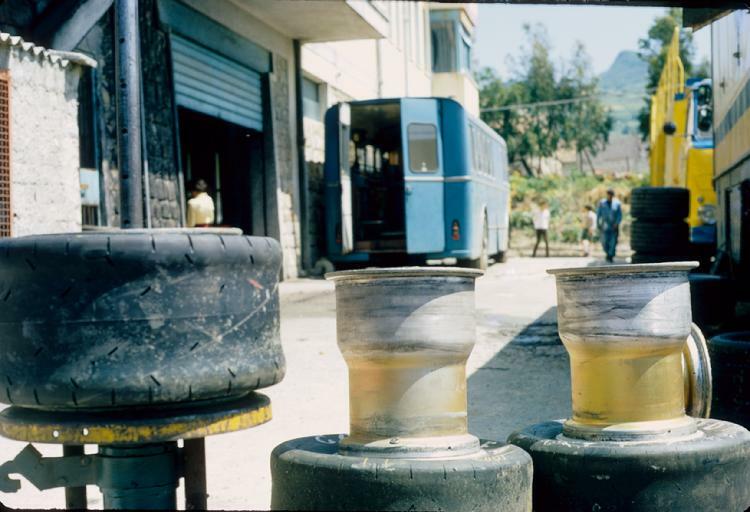 Due to a severe shortage of 'rain' tires from sponsor Goodyear, Autodelta was forced to prepare for the changeable weather patterns of Sicily by assigning two mechanics to regrove many of their existing tire stock with hot tire-grooving tools for an entire day. The men worked here by the side and ended up with one set of rain tires for each entered car...never in actuality to used during the race but were handy as spare tires for those of us assigned to mountainous duty located around the circuit as service assistance. 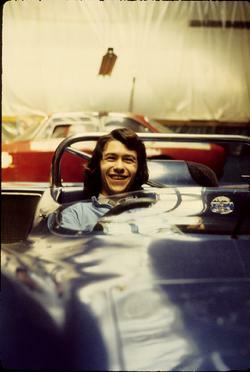 You will note the red GTA, one of several, in the background used by Autodelta drivers as training cars to become acclaimated to the 44 mile circuit. "One of Ing. Carlo Chiti's Darkest Hours... 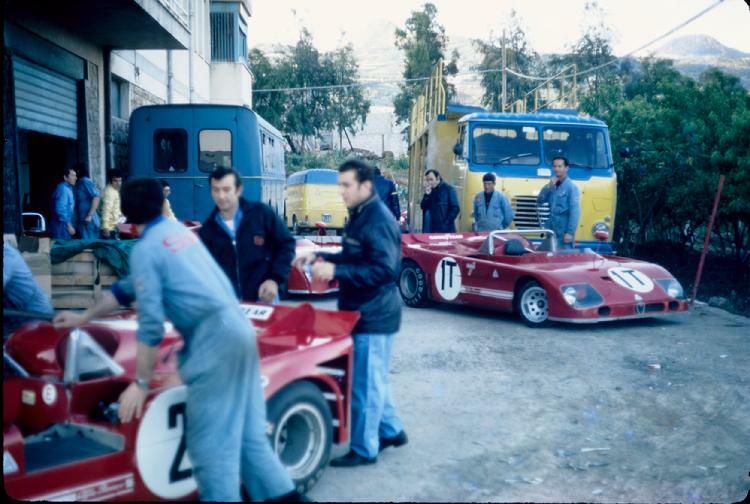 The 1972 Targa Florio." 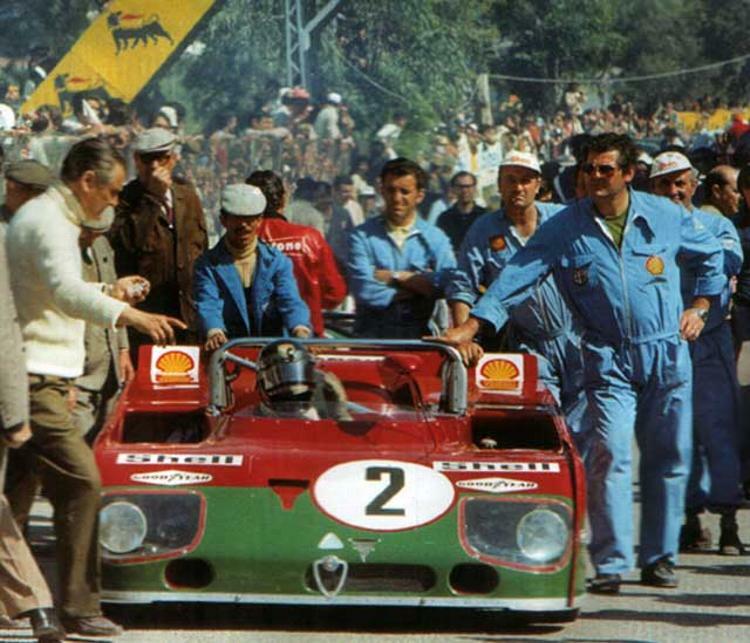 In spite of daunting odds stacked against him and in an heroic struggle on the final 44 mile lap of this historic 484 mile race through the Sicilian countryside to win the prized laurel wreath and to bring honor to the House of Alfa Romeo once again in the Targa Florio, a truly 'possessed' Austrian Dr. Helmut Marko leaped into his drivers seat for his final turn behind the wheel. Behind by more than two minutes.... he struggled valiantly ...with his eyes piercing the daytime sky as two flaming lightning bolts ...throwing his nimble T-33/3 from side to side skipping across the asphalt like a stone being tossed across a still lake ....regained all but a mere 16.8 seconds.... but in the end losing to Sandro Munari's Ferrari 312 P in one of the most thrilling episodes in Alfa Romeo racing history. Passing my roadside vantage point in the mountains, the drive of Dr. Marko was the most exciting and utterly captivating 10 seconds I personally...to this very day...have ever witnessed in my entire motor racing lifetime. Autodelta had made a major concerted effort to win here and threw the entire weight and prestige of the parent company behind this effort. 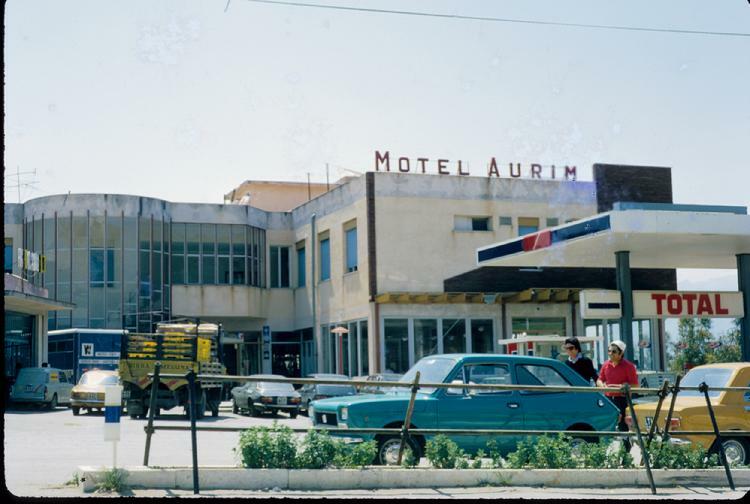 The team rented garage space from the Hotel Aurim in Cerda. 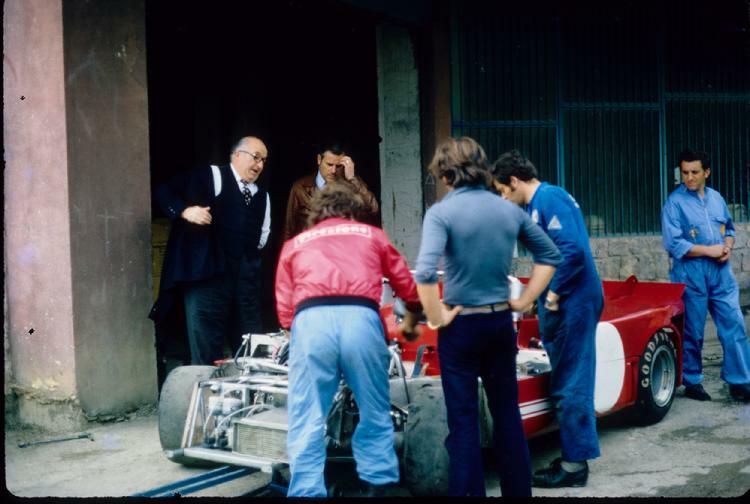 Above, you see test driver Teodoro Zeccoli standing on the left, Roberto Banfi, the master transmission and differential wizard on the right and a training GTA in the background. 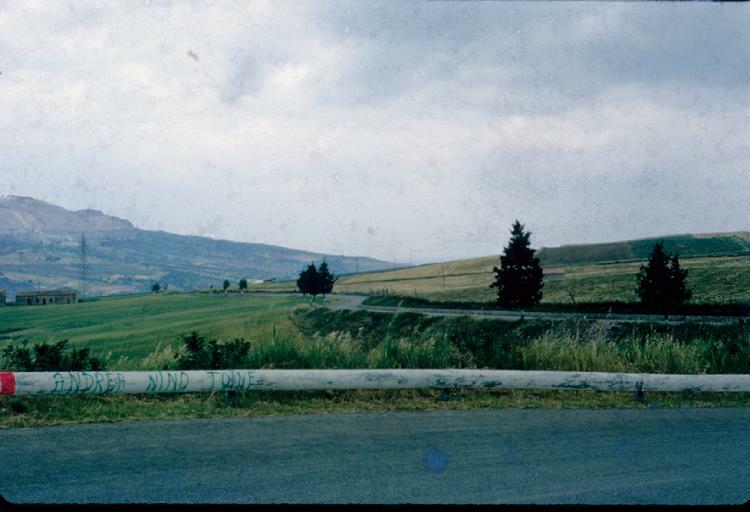 'Training' cars were employed to permit drivers to learn the 44 mile circuit throughout the beautiful Sicilian countryside. As the lowest member of the Autodelta 'totem pole' I was responsible for keeping all of the cars in spotless condition during the season so that history would record every Autodelta car looking its absolute fastest and shiny best in then present day track appearances and in all future photographs. 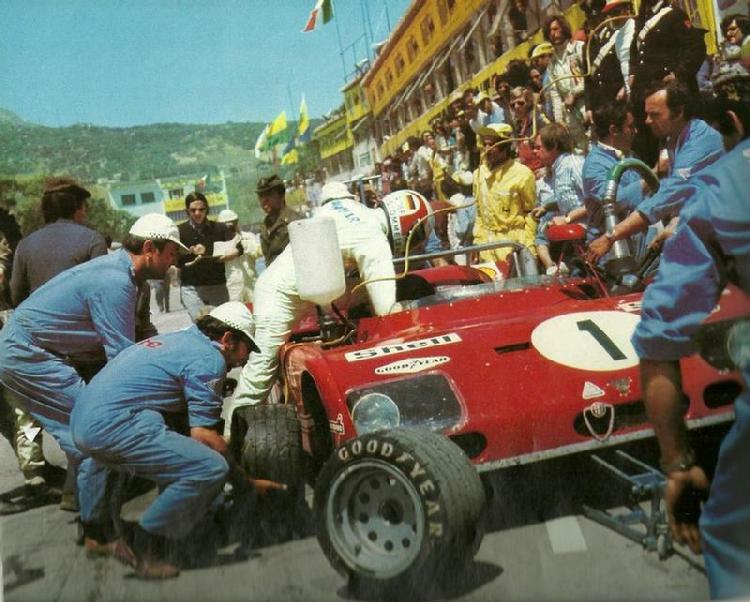 For the actual race I was stationed somewhere along the course in the mountains equipped with front and rear spare tires, fuel, a few tools, gasoline, coolant and a large Alfa Romeo sign board to represent an assistance point for drivers to become familiar with. Shiny body panels, wouldn't you agree? Andrea de Adamich with transmission / differential specialist Roberto Banfi. 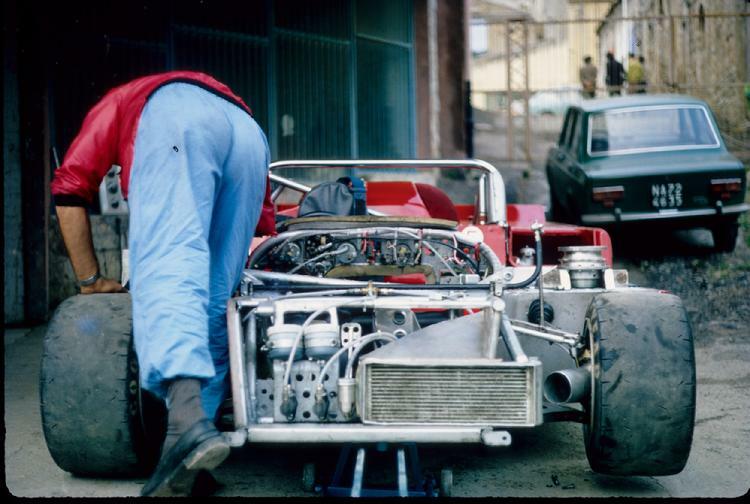 Notice the spare wheel and mounted tire to Andrea's left side, to be changed only by the driver if required along the circuit. 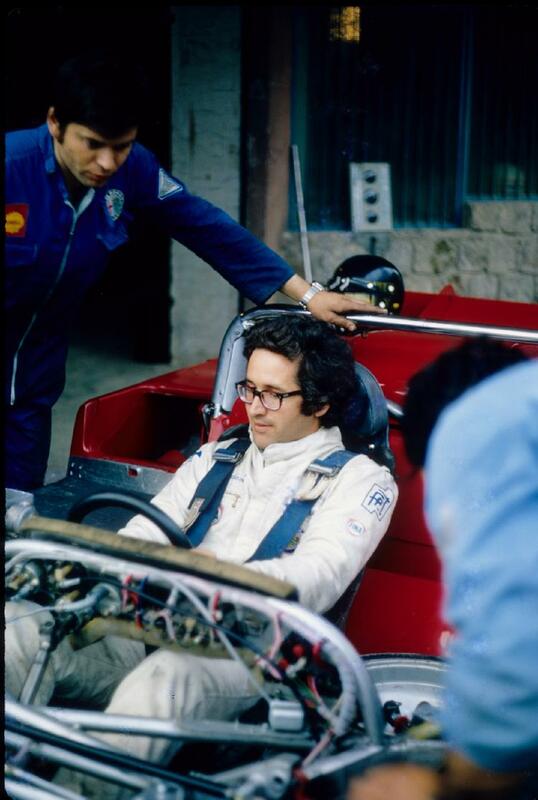 Rolf Stommelen at the controls of the team "muletto" at high speed... established as a training car used by drivers to become fully proficient in the circuit at full speed without wearing out one of the super fresh starting grid vehicles. This single photograph is my overall emotional favorite among all of my experiences with Autodelta over the years...distilled down to one single iconic image at one breathtaking moment in time. This image represents the very essence of the historic Targa Florio where.... at 'full chat' ....a T-33/3 V-8 could be heard blaring in the far distant mountains long before it suddenly appeared....slicing this quiet Sicilian village of Cerda into two violently loud reverberating pieces. "And in mere seconds it is out of sight again... in an intoxicating mixture of deafening 'fighter jet' thunder, screaming tires and a blood red streak of greased lightening." 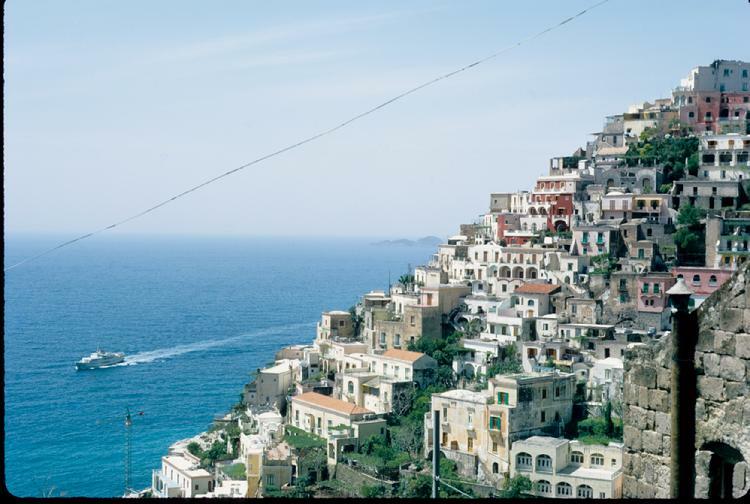 Image Courtesy of Autodelta Italia website www.AutodeltaItalia.com. Here are three additional photographs that are added... because for the actual race... Ing. Chiti sent me to a mountainside post somewhere along the circuit with a set of tires, many liters of benzina, antifreeze solution and tools along with a large round Alfa Romeo logo sign to inform our drivers that I was offering emergency "Authorizato Servizio"! I never the saw the race from the pit area standpoint where some of the greatest ultra time-sensitive action occurred. However, I would never have traded that for the 10 seconds I witnessed Dr. Helmut Marko flying around the mountainside in front of my location literally transforming his 33TT3 into a virtual "Disco Volante". Those ten seconds became the greatest motor racing experience of my entire lifetime. 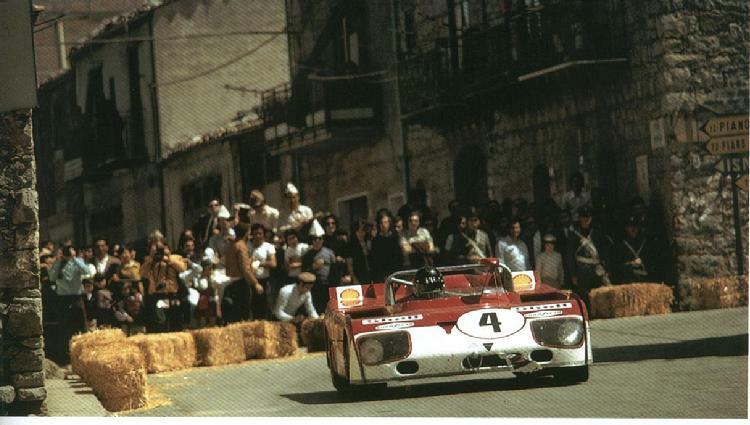 And I shall never forget him or his epic drive on the final 44 mile lap of the 1972 Targa Florio! And despite the superhuman drive of Dr. Marko, Autodelta would lose the race by a stunning 16.8 seconds...the most dramatic Targa Florio finish in history. Rolf Stommelen taking over the controls in pit lane. 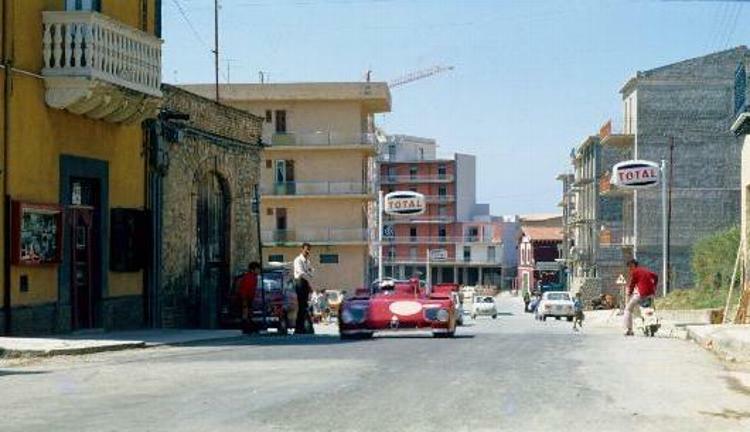 Let me leave you with one of my fondest memories...the sight of a beautiful Sicilian village on a perfect Sunday afternoon providing an idyllic background for Andrea de Adamich and his historic Alfa Romeo T33/3. This entire feature "Autodelta Golden Years" is made available for personal and non-commercial educational use consistant with the principles of "fair use". To the best of our knowledge, some images contributed for this story have no known copyright restriction based upon available information and that the editor is unaware of any such restriction. In the event an image is found to be under copyright, we will remove the image promptly if requested, with apologies.